I adapted this from a recipe that appeared in the Detroit Free Press. It was originally sent by Robert Harrison of Swartz Creek, Mich. If you make only two chicken breasts, you don’t need to add any water to the egg. I used panko bread crumbs, which I think adds a little extra crunch. The recipe is a little long and involved, but not difficult. We used the frozen Empire chicken breasts from Costco, which are quite large, and so we had one left over after the meal (but we used all the raspberry sauce). The next day I sliced it in half vertically and we had lovely cold chicken sub sandwiches for supper. Put the flour, salt and pepper in a plastic bag. Add the chicken breasts and shake until the breasts are coated. Put the beaten egg in a shallow dish, and in another shallow dish, combine the sesame seeds, breadcrumbs, garlic powder and ground ginger. Shake off any excess flour from the chicken pieces, then dip each one in beaten egg and then in the breadcrumb mixture, pressing down so that the breadcrumbs and sesame seeds stick to the chicken. Set aside until all are done. Heat the oil in a large skillet, and sauté the chicken breasts over medium-high heat about 2 minutes on each side until they are browned. Don’t crowd them in the skillet, but do in two batches if necessary. Remove to a baking sheet. Bake for about 15 minutes (more or less depending on size and thickness of the pieces) until chicken is fork-tender and cooked throughout. While chicken is baking, combine the sauce ingredients in a small saucepan or microwave-safe bowl. Heat to boiling and boil for 1 minute. Remove from heat and cool for a few minutes before serving. 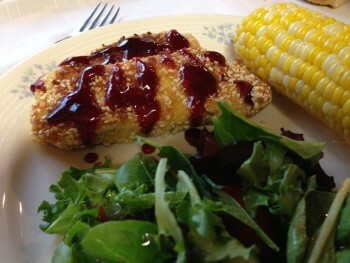 Arrange the chicken on a platter or individual plates and drizzle the raspberry sauce over the top. We’re starting to see fresh corn in the markets again, so keep this recipe on hand for the summer months. The original recipe called for frozen corn, but use fresh if you can get it. I also added a few squirts of Tabasco and a pinch of ground nutmeg. 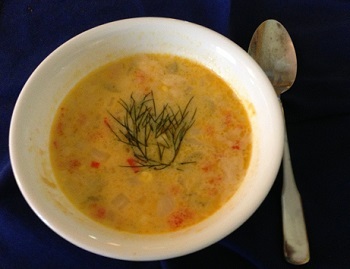 The potato is optional, but it gives the soup some body; cook it for about 15 minutes before adding the corn. The soup is good with fat-free milk, but if you make it with whole-fat milk it will taste richer. You can probably use cooked salmon instead of smoked salmon and increase the amount of salt slightly. Once the smoked salmon is in the soup, it tastes like regular salmon! This is not one of those soups that has to simmer for hours, so you can make it with little advance planning if you have the ingredients on hand. Saute the onion, celery and red pepper in butter over medium heat until the onion is just beginning to brown, about 8 to 10 minutes. Stir in the flour and cook, stirring constantly, another minute or two. Add the warm stock, stirring till smooth, and cook another 2 or 3 minutes until it thickens slightly (here’s where I would add the potato and cook a little longer). Add the milk and reduce heat to a simmer. Cook for 3 to 4 minutes, stirring occasionally. Add the salt, black pepper and corn. (Remember that the smoked salmon will add some salt, so don’t use too much; you can add more later if necessary.) Add the Tabasco and nutmeg if desired. Bring back to a simmer and cook for about 5 minutes. Turn off the heat. Stir in the salmon. Serve immediately, sprinkled with a chopped fresh herb such as parsley, dill or chervil. Seems like it’s time for another dessert recipe. Here’s an easy one that I found online when I was looking for something to go with a story on my other food blog, Feed the Spirit about the summer solstice. That’s a holiday much honored by Wiccans, who are unfortunately often called pagans. The cake is easy to make. You just mix it up and bake it. 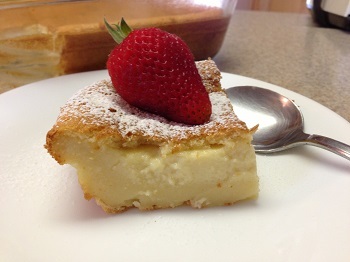 The batter is rather thin, but in the oven it magically separates into a thin crust, a custard-like filling, and a thin brown top layer. If you haven’t already you can subscribe in the left-hand column of the Feed the Spirit page to get a heads-up each week about what’s new on the blog. And I’m always eager to have guest bloggers; I just need a short story about food in the context of faith, family, friendship or ethnic culture, a recipe and a photo. Preheat oven to 325 degrees. Grease an 8 x8-inch baking dish. Separate the eggs and beat the egg whites until stiff; set aside. Using an electric mixer or whisk, beat the egg yolks with the sugar until light. Add butter and vanilla extract and continue beating for another minute or two. Add the flour and mix it in until fully incorporated. Slowly add the milk and beat until everything is well mixed together. Add the egg whites, fold them in, a third at a time using a spatula. Or you can add a third of the egg whites and gently whisk them in to the cake batter, then reverse the process and add a bit of the cake mixture to the egg whites and gently whisk in; repeat until all cake batter has been whisked in. Pour batter into baking dish and bake for 40 to 70 minutes or until the top is lightly browned and the center doesn’t jiggle when you shake the pan. The baking time can vary greatly depending on the oven, so take a peek at around 40 minutes and see how it looks. Continue baking, if necessary, in 5-minute increments. Sprinkle with powdered sugar after cake has cooled. This comes from Cooking Light magazine. The recipe says it serves two, but I made it with large chicken breasts and it was ample for four. I served it with spaghetti. You could use fettucine or another long pasta, rice, couscous or barley — anything that will sop up the tasty sauce. 2 boneless skinless chicken breast halves. Sprinkle chicken with salt and pepper. Heat oil in a large nonstick skillet over medium-high heat and cook chicken 8 to 10 minutes or until no longer pink in the center, turning once (if your chicken breasts are large, it will take longer than this). Remove chicken to a serving plate and cover loosely with foil. Stir in the artichokes and cook for a minute more. 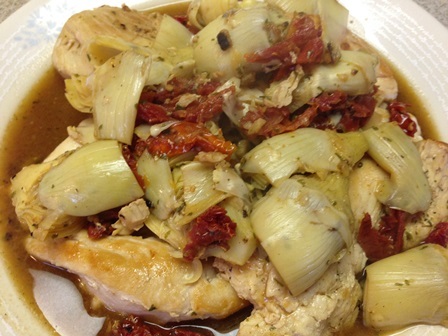 Spoon the vegetables and sauce over the chicken, and sprinkle with parsley.